The name “Dotonbori” generally refers both to the Dotonbori Canal and to Dotonbori Street which runs parallel to the canal’s southern bank. 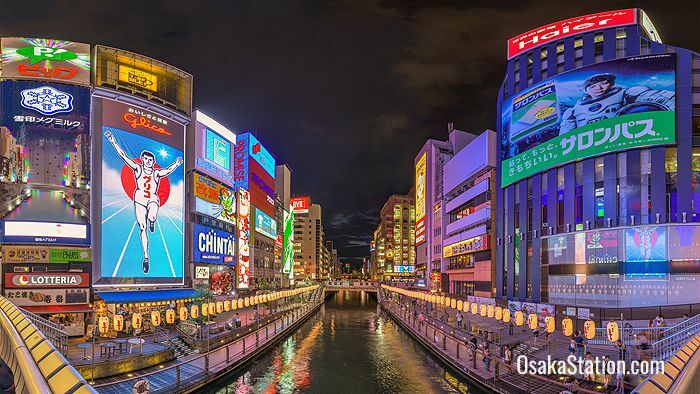 It is one of the most colorful areas in Osaka and an absolute must-visit location when traveling through Kansai region. The history of this area goes back to 1612 when a merchant by the name of Yasui Doton invested all of his personal capital in an ambitious local development project. Doton’s plan was to divert and expand the Umezu River into a new waterway that would link the local canal network with the Kizugawa River. Unfortunately, Doton’s project was interrupted by war and he himself was killed during the Siege of Osaka in 1615. Later that same year, Doton’s cousins completed his work and in his memory the new canal was named Dotonbori or “Doton Canal”. The new canal brought with it a flood of trade and from 1626 the area began to flourish as an entertainment district too after theater companies and playhouses began to move into the area on the canal’s southern bank. 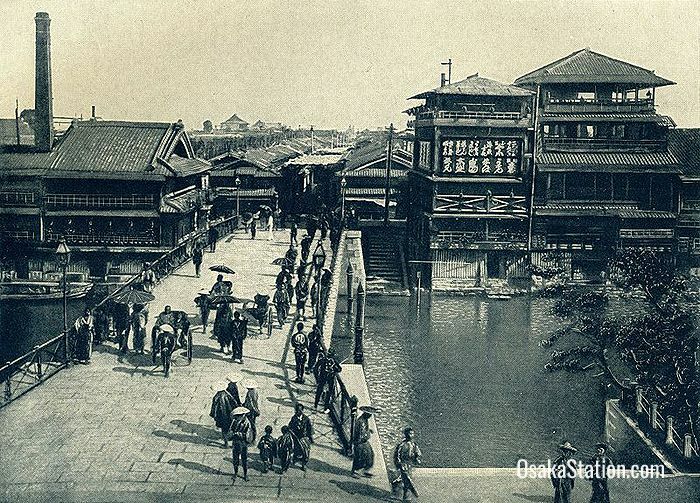 At the same time the north bank of the canal began to prosper with restaurants and teahouses that supplied food, drink and entertainment to theater goers after they left the theaters. Today Dotonbori’s theater culture is very much in decline. In World War II bombing raids destroyed all the theaters except for the Shochikuza. 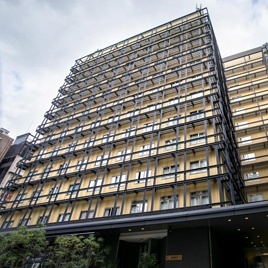 However, there are still a number of small comedy clubs in the area and the Shochikuza continues to host classical kabuki plays, opera, modern dramas and musicals. These days however, Dotonbori is better known as a gastronomic wonderland crowded with restaurants, street side food stalls, and bars. 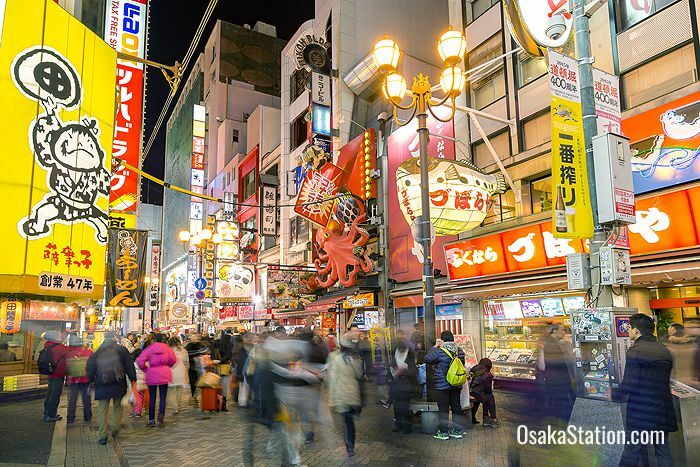 Osaka’s obsession with food is often summed up with the expression “kuidaore” which is often interpreted to mean “eat till you drop” but actually means to spend so much on food that you fall into financial ruin! 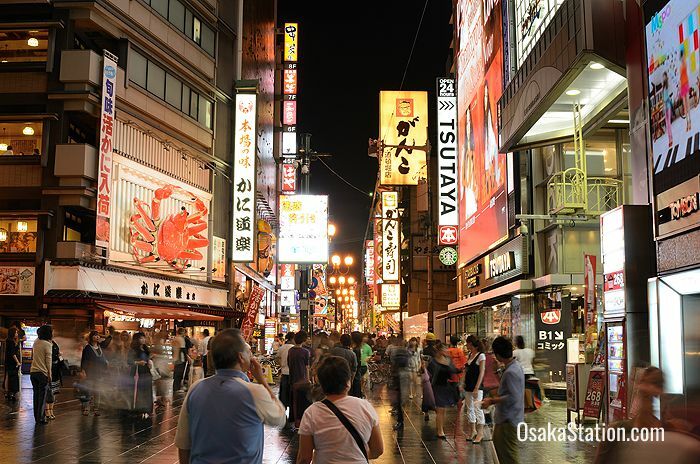 Dotonbori is said to be the best place in Osaka to experience this kuidaore style extreme love of food! 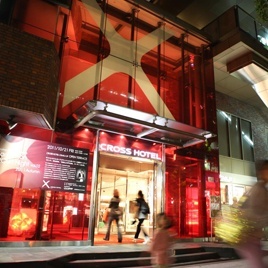 Famous restaurants in Dotonbori include the following. Hariju has been serving prime Japanese beef shabu shabu and sukiyaki in Dotombori since 1948. Zubora-ya is a fugu or pufferfish specialty restaurant. Kukuru is a takoyaki octopus dumpling shop. Kani Douraku is a super popular crab restaurant. Kani Douraku is easily recognized by the giant moving crab on its shopfront, but if you want to eat here it is a good idea to book a table in advance as the waiting time can be as long as 3 hours! 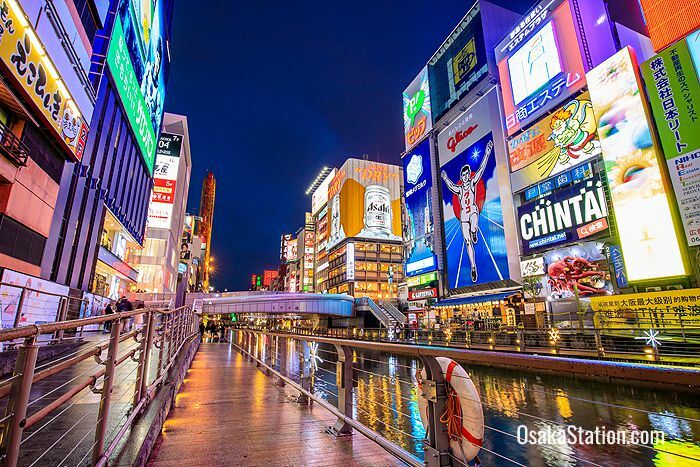 Dotonbori is famous for its eye-catching signage and billboards with a giant pufferfish, an octopus, a clown, the Kani Douraku crab all vying for your attention and creating an amusement park-like atmosphere. 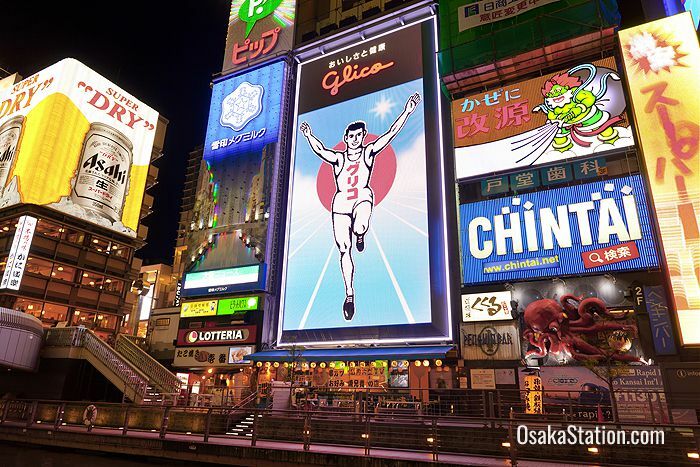 Of all these signs however, the most famous is that of the Glico running man above Ebisubashi Bridge. An advertisement for Glico candy, the 20 meter tall and 10 meter wide sign shows a man running on a blue track with his arms raised in victory. 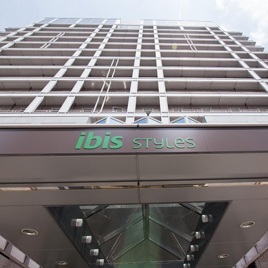 This is actually the 6th version of the sign which was last renewed with LED lighting in 2014. However, the first Glico sign was installed here in 1935 and over the years it has become a much loved landmark of Osaka’s Minami area. In fact the Glico running man and Ebisubashi Bridge below it is the focal point of Dotonbori. It is a popular meeting spot, an essential photo stop for tourists, and the site of wild celebrations when local sports teams are victorious. 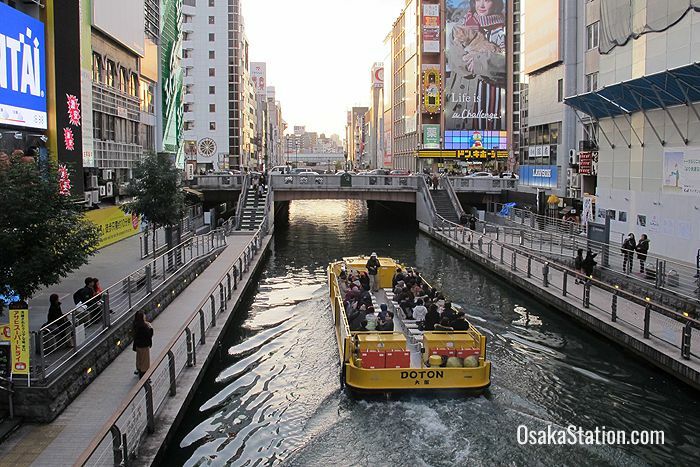 The Dotonbori entertainment district generally designates the area between the Daikokubashi and Nippombashi bridges on the Dotonbori Canal with its focal point located at Ebisubashi Bridge. 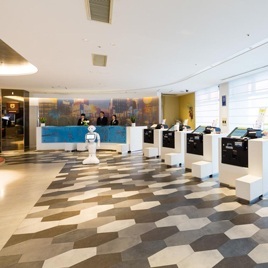 It is located in the Minami or “South” district of Osaka and is easily accessed from Namba Subway Station which is just four minutes away on foot. Article by Michael Lambe. Photos by Michael Lambe, Komain Intarakamhaeng, Sean Pavone, Bennnn, F11photo. All rights reserved.